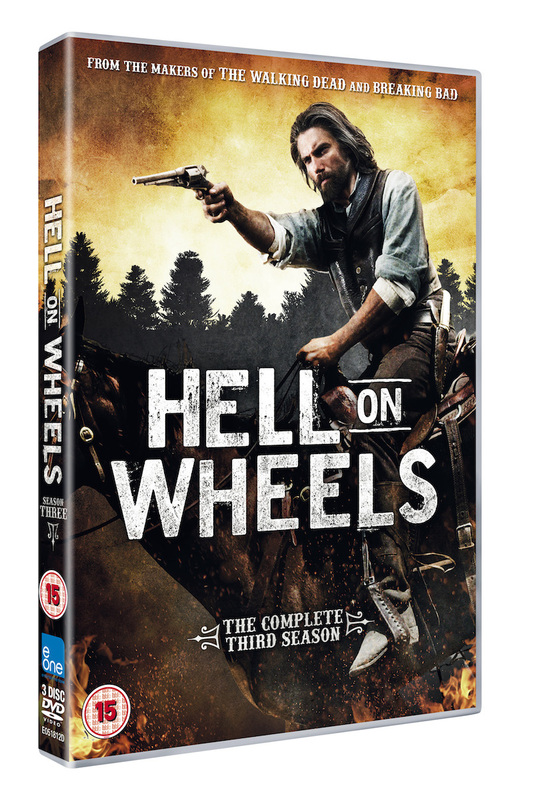 The 3rd season of the brilliant Hell on Wheels, staring Anson Mount as former soldier Cullen Bohannon arrives on DVD in the UK on the 18th of August 2014. Bohannon is back and with a new mission in mind. Abandoning his quest for revenge for the deaths in his family, Bohannon takes up arms against Durant (Colm Meaney) and along with Elam (Common) travels to New York to take control of the Union Pacific Railroad. Blood will be spilled, lives will be lost and men will be ruined in what promises to be the most thrilling season to date. A former Confederate soldier still haunted by his past, Cullen Bohannon made a home in Hell on Wheels hunting down the men responsiblefor slaughtering his family. Following the murder of Lily Bell and an Indian attack that destroyed Hell on Wheels, Cullen spends a long winter in a burned-out caboose, reshaping his lust for revenge into a burning ambition– to take control of the Union Pacific and drive it across the country. In the process, he begins to rediscover the man he might have been had war and tragedy not intervened. Elam Ferguson is an emancipated slave coming to terms with the risks, responsibilities and limitations of his newly acquired freedom. Empowered by Bohannon with a gun and a badge, he finds himself torn between his responsibility to his job and his responsibility to his woman and their new baby. Thomas “Doc” Durant, based on the real-life railroad impresario, is an entrepreneur taking full advantage of the changing times. After the Union Pacific board throws him off the railroad, Durant schemes to regain control and reclaim his rightful place in history, lining his pockets all the while. Unfortunately for him, Cullen Bohannon’s own ambition stands in his way.